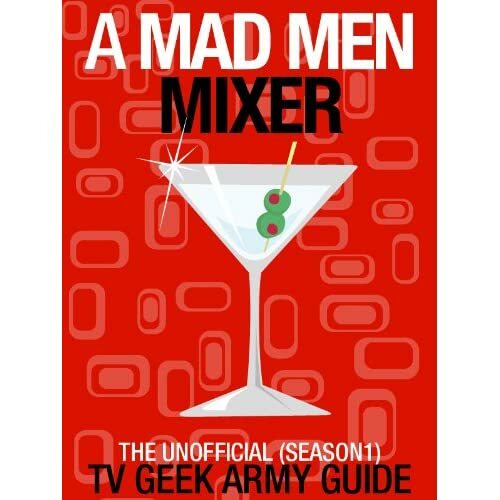 Posted on Monday, August 23, 2010, by Eric - TV Geek Army "Revered Leader"
Quick Take: Mad Men, "The Chrysanthemum and the Sword"
Review: Mad Men, "The Chrysanthemum and the Sword"
(S0405) This was a classic episode of Mad Men. Not so much in the sense of "all time great" (though it was quite good) but in the sense of it had storylines involving the office and ad agency business – the competition with an upstart agency to snag a Honda account – paired with machinations on the home front with Betty and Sally. That plot structure seems more reminiscent of what we've seen over the first few seasons, and I felt a more predictable rhythm with than any other episode this season. Of course, we've had some true masterpieces thrown at us already in this season with a bevy of surprises and twists so it's perfectly reasonable and acceptable that we have something of a more "traditional" sensibility this week. Let's start with Don Draper (Jon Hamm). While he certainly has as much pressure on him as ever, he seems to have pulled out of the deep funk of alcohol-fueled self-pity that has plagued him of late. It was remarkable to see him able to discuss his feelings so openly to Dr. Faye Miller (Cara Buono) ("I'm not doing well"), though he ironically questions why people feel the need to talk about themselves in the same conversation. It would seem that Faye would be the perfect woman for Don's tastes – modern, intellectual, confident, attractive. And she reveals that she wears her wedding ring (the same one that Peggy Olson tried on for size in "The Rejected") only as a "stop sign" to fend off unwanted office advances. It's also noteworthy that Don's light flirtation with her in the office kitchen over a glass of sake felt like the most confident Don we've seen in some time, didn't it? I particularly enjoyed his parting joke about Faye leaving to go out "to fake dinner plans with your fake husband." While we're still at the office, we saw the introduction of a new cultural influence as well as some old school chicanery in the attempt to snag a lucrative account. Japanese products in the mid-1960s did not have the same place in U.S. society that they enjoy today. So it's a lot of fun to see early interactions between Japanese executives of future powerhouse Honda and the partners of Sterling Cooper Draper Pryce. Bert Cooper (Robert Morse) of course is the perfect liaison between the two cultures because of his fascination with Asian culture (though they would refer to it as the Orient back in the day), but the big problem comes in the form of Roger Sterling (John Slattery), a naval veteran of World War II's Pacific theater and, if his stories are to be believed – such as the drunken one he told in Season One before hitting on "hot pants" Betty – he saw some real action. Still, 1965 is twenty years out from the end of that war and the mood of the country and the agency is to look ever forward. Therefore, Sterling's no holds barred attempt to scuttle (sorry for the naval pun) the account pitch does not sit well with anyone in the office, and we see a rudeness and unprofessionalism that not even Don has nearly approached. Roger eventually apologizes, no doubt the result of a heavy off-screen strong arm from Bert, it reveals a very new and interesting power dynamic amongst the partners. Pete Campbell (Vincent Kartheiser) has been the rising the star of the new firm since its founding, something that Don has both noticed and appreciated (and a far cry from their dysfunctional father-son relationship of seasons past). The Honda incident causes Campbell to unload on Roger, the former claiming that the more new business the firm gets, the less dependent they are on Lucky Strike and, in effect, the less power that Roger has. The true game changer is that after Pete announces that "we're all trying to build something here and leaves the room, Don readily agrees with his former rival. There's also a new rival agency to SCDP in the form of Ted Chaough of Cutler Gleason & Chaough (CGC), who tells The New York Times' advertising beat reporter that he's the one that Don Draper sees every time he looks in the rearview. They are the rival for the Honda account, which allows Don to decide to use their evidenced aggressiveness and his takeaways from reading The Chrysanthemum and the Sword (a 1946 book which studies Japanese culture and its seeming contradictions from a Western perspective) to pull a fast one. This involves making it appear that SCDP is going all out and breaking the rules set by the Honda execs for the pitch ($3000 spending cap, mandate for "unfinished work" only) by going for a full blown spec television commercial. The ruse provides some fun moments, such as Peggy (Elisabeth Moss) riding a Honda scooter around an otherwise empty film set while Joey holds off the CGC guys from trying to see inside. The move seems to have worked as Don, alone at the pitch meeting and with no presentation, declares that his firm cannot take part in a competition in which the rules are not being honored. While Honda decides to stay with Grey (anyone thinking that Duck Phillips is involved with the account?) for its motorcycles, SCDP has maneuvered around Roger's actions and moved into prime position for what could an enormous prize: Honda's nascent line of automobiles. Meanwhile, we get to see what's going on with Betty (January Jones), Sally (Kiernan Shipka), and Henry Francis (Christopher Stanley) after a noticeable two episode absence. Sally… isn't dealing with the divorce so well, but more than that she must contend with Betty, who more than ever seems to be in the running for Worst Mother of the Year award. After Sally cuts her hair while Phoebe, Don's next door neighbor and nurse, is babysitting, Don freaks out mostly because he knows Betty will freak out, and then Betty freaks out indeed, slapping her across the face upon the kids arrival home. Later things get a lot more awkward and worse when it's strongly implied that Sally is "playing with herself" while sleeping over at a friend's house. Now, the way the scene is shot it's hard to tell exactly what is going on (thankfully), but my take is that Sally is doing nothing unusual or abnormal, and a "with it" parent could have handled things with a quick "this is inappropriate in public" talk. However, the mother of Sally's friend takes her home, which causes Betty to truly bug out, this time threatening to cut Sally's fingers off (creepy!). Henry, who seems like a patient man exhausted by all the kids in his new family (including Betty), talks Betty into sending Sally to a child psychologist. Dr. Etna seems like she can actually be of some service to the new Francis clan, but it's an interesting touch that she recommends to "start" at four days a week plus a once a month session for Betty. More priceless moments from Mrs. Blankenship this week. It's painfully and hilariously clear how good Don had it during the Allison era. We see Bethany (Anna Camp) for the first time since "Public Relations." Don seems to enjoy her company, but perhaps she's the right kind of date for his market research in checking out the local Benihana? "It's probably the kids." – Henry, hearing a car pull up outside the house. Notice how disappointed he sounds? Speaking of houses, notice that Betty and fam haven't moved out yet? I love the scene where the Honda execs get a tour around the office. "How does she not fall over?" an exec says in Japanese with regard to Joan (Christina Hendricks). And nice touch that he get David Carbonara's "tour of the office" theme music in the background. Don is trying to get through to California but is not getting a response, says Mrs. Blankenship. That's a big "uh oh" regarding Anna Draper. Smitty's (Patrick Cavanaugh) back, at least for a cameo! Cool to see him show up at CGC and a fun bit too with his reference to Draper as a genius, which causes Tom to throw him out of his office. Love that the Honda execs refer to Sterling as "white hair" amongst themselves. Nice to see Carla (Deborah Lacey) if but briefly. Is this the first time we've seen her this season? Video: Mad Men, "The Chrysanthemum and the Sword"
From Around the Web: Mad Men, "The Chrysanthemum and the Sword"
A.V. Club: Some of us wonder just what the show's building to with this whole "Don Draper is lost" plotline and worry that it's not going to say anything meaningful about the character when it's all said and done. Some of us find Sally Draper plotlines interminable. And some of us think Betty Francis is slowly turning into Livia Soprano. Slate: Finally, someone says out loud what we've all been thinking: "I don't know how people drink the way you do around here. I'd fall asleep." The speaker was Faye Miller, accepting a glass of sake from Don during their heart-to-heart in the kitchenette. Esquire: And if you thought you were being set up to dislike Don's new rival, Ted Chaough, that cut to Turtleneck Row in his office was like a sharp turn into Sleazeville. I mean, pulling off a turtleneck sweater is just tricky at best. You've got to have a better silhouette than Ted, and a better outfit than the ex-Sterling/Cooper goldenboy with his thin black turtle tucked into high-waisted trousers. Ouch.